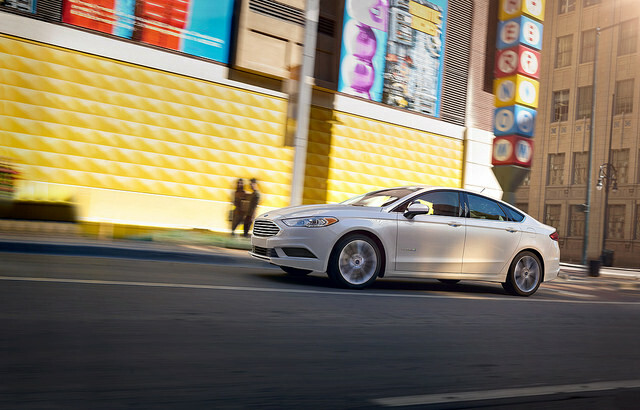 Ford is making city life much more environmentally friendly. The American automaker has introduced two new fuel-efficient Ford taxis to its commercial vehicle lineup, giving taxi operators the chance to go green. The first eco-friendly option is for taxi drivers that need a bit more space. The new 2019 Transit Connect Taxi is now available with a 1.5-liter EcoBlue® diesel engine, which has an EPA-estimated 30 mpg highway rating. * With seating for up to five and a flexible interior that makes it perfect for taxi-based services, this vehicle is ready to work hard no matter what you need it for. The second green taxi option is the first-ever Fusion Hybrid Taxi. Similar to the Ford Police Responder Hybrid, this vehicle has heavy-duty chassis parts that will help improve its durability. It has an EPA-estimated fuel efficiency rating of 40 mpg in the city and 36 mpg on the highway, which will help reduce carbon footprints throughout the United States. ** It also has heavy-duty cloth seating, vinyl floors, a standard rearview camera, and a mounting plate on top of the dashboard to help you secure your taxi meters and other fleet equipment. Both of these vehicles are available to order now, though you will have to wait if you want to opt for the diesel engine on the Transit Connect Taxi. To learn more about these eco-friendly Fords, stop by Shults Ford. *Actual mileage will vary. Final EPA-estimated ratings available early 2019.